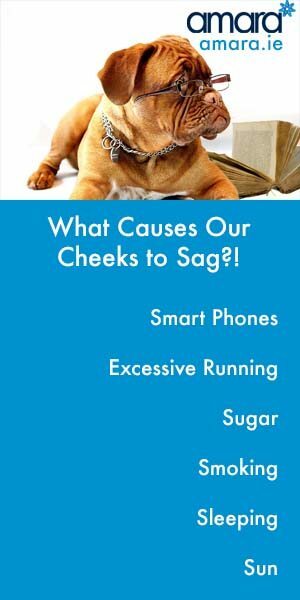 How Can I Stop My Cheeks From Sagging? As we age it’s natural for our cheeks to start to sag.As they sag they can give us a jowly look that ages us. However we can combat this sag and reclaim our face! Our Nasolabial folds are the two folds of skin that that run from each side of the nose to the corners of the mouth. As we age these may tend to grow in length and depth giving a dropping look. As we age the fat pads in our face start to droop naturally as we lose collagen in our skin – Sleeping on our sides can also naturally drag down our face on the side we sleep on. Although our skin sagging slightly is a natural occurrence there are many surprising things we are doing to make it worse. Naturally encourages our chin to droop and skin to fall. Yes it’s so unfair that what good for our body and our face isn’t always the same thing! Excessive running can cause us to prematurely age as the ‘pounding action’ is pulling your skin away from the muscles. An obvious one, when we eat sugar the molecules begin to attack our protein fibres wearing them down! The sun’s harmful UV rays attach our skin wearing down the collagen and causing us to lose elasticity on our skin. A facelift can of course for sagging cheeks or jowls, however we can do this is in a much simpler and quicker way with Dermal Filler. This reduces the heaviness on our face which contributes to making us look older. Though Dermals .fillers are the quickest and most efficient way of reducing heaviness other collage induction therapies can also show a great improvement. With the Rejuvapen we can induce collagen back into the skin – this will take a number of treatments and will result in a plump and stronger skin. Micro Needling also removes scarring or any marks on the treated area. Do you feel like your cheeks could use a lift? Why not book in for a free consultation and see what see what we can do to help!